The world’s first photo booth was stationed in Times Square nearly a century ago. Now, New Yorkers and visitors are invited back to snap some black and white self-portraits in a photo booth truck hosted by Inside Out’s French street artist JR. The artist has launched Inside Out New York City, taking place from April 22 to May 10, 2013, to provide community members the opportunity to make a statement and participate in creating works of art out of messages of individual identity. The digitally uploaded photographs are printed as posters and displayed on Duffy Square or publicly in the subjects’ home communities. Inside Out is a worldwide platform for anyone to reveal untold stories. The project gives participants the chance to become visible as larger-than-life portraits and to simultaneously remain anonymous. 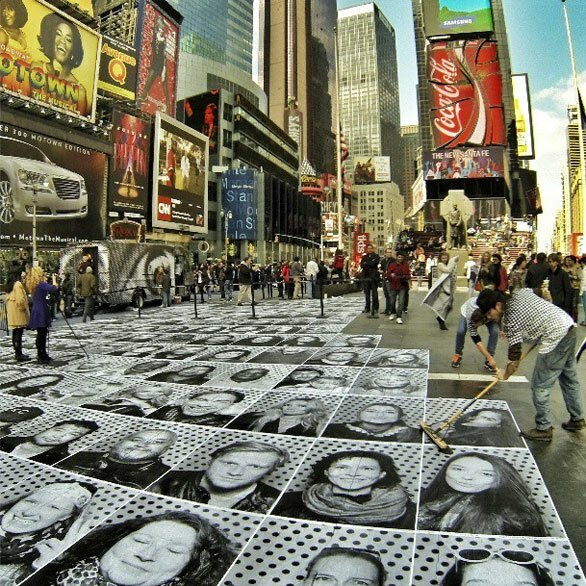 JR’s endeavor strives to emphasize Times Square as a creative core, but also engages New York City’s other boroughs. The photo booth truck is making stops in the Bronx, Staten Island, Queens, and Brooklyn, to give attention to communities affected by Hurricane Sandy. Participants can take part in the photo booths instantaneously and at no cost. Within just one minute, a black and white poster is printed. Participants then leave the 3-foot-by-4-foot posters in a public place of their choosing. The exhibitions will be documented, archived, and viewable online. So far, more than 120,000 posters have been sent to over 108 countries since March 2011 as part of the Inside Out project. The self-portraits convey countless themes including diversity, gender-based violence, and climate change. If you want to help Inside Out and will be in NYC between now and May 10, email nyc@insideoutproject.net to volunteer by yourself or with a group.